“Can I carry my baby in this heat? We are getting way too hot with our sling!” is a question I am asked many times in the few warmer months we get in the UK. Babies are warm little creatures, and in the summer humidity, they can feel like hot-water bottles on your chest. Many parents stop using their slings in the summer as they don’t enjoy the sweatiness and stickiness that can come with hot-weather babywearing, and then miss the closeness. Sometimes children insist on being carried, so you get hot anyway, or pushchairs aren’t an option.. so what is a parent to do? First of all, don’t worry. You won’t overheat your baby by carrying him. Women in far hotter climes than the UK carry their children daily and come to no harm. The body is able to thermoregulate appropriately. However, there are a few things you can do to make the experience more pleasant for you both. 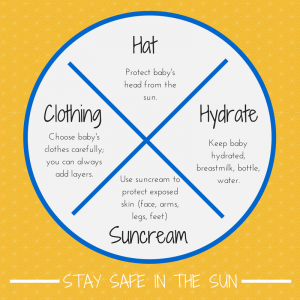 1) You and your baby need to be safe in the increased temperatures. Keep well hydrated. Baby needs to replace all the fluid she is sweating out – don’t underestimate her need to drink or breastfeed in warm weather. Take frequent breaks from your summer activity to check on your child and allow this re-hydration. Breastfeeding mums will need to increase their own fluid intake to compensate for the higher milk demand (breast milk becomes more watery and thirst-quenching in hot weather, amazing!) and everyone will need to drink more. Exclusively breastfed babies can get all their fluid requirements by frequent feeding and are unlikely to need any other fluids if they are feeding well. Bottle fed babies may well need some cool boiled water in addition to their formula. Sweating actually helps to cool the body down, by using the heat beneath the skin to evaporate the moisture. The better hydrated you are, the easier it will be to provide sweat. Adults are better able to thermoregulate than small children, so you can actually help to cool your hot child down by skin to skin. Think about the clothing you’re both wearing. Layers of clothes trap air, and therefore can keep heat in in cold weather.. so in hot weather, wear less layers on yourself, and reduce your child’s clothing too. Natural fabrics tend to be cooler – pure cotton, linen, bamboo allow breathability more than man-made fabrics and tend to cause less stickiness. The sling counts as layers of clothing, so take that into account. 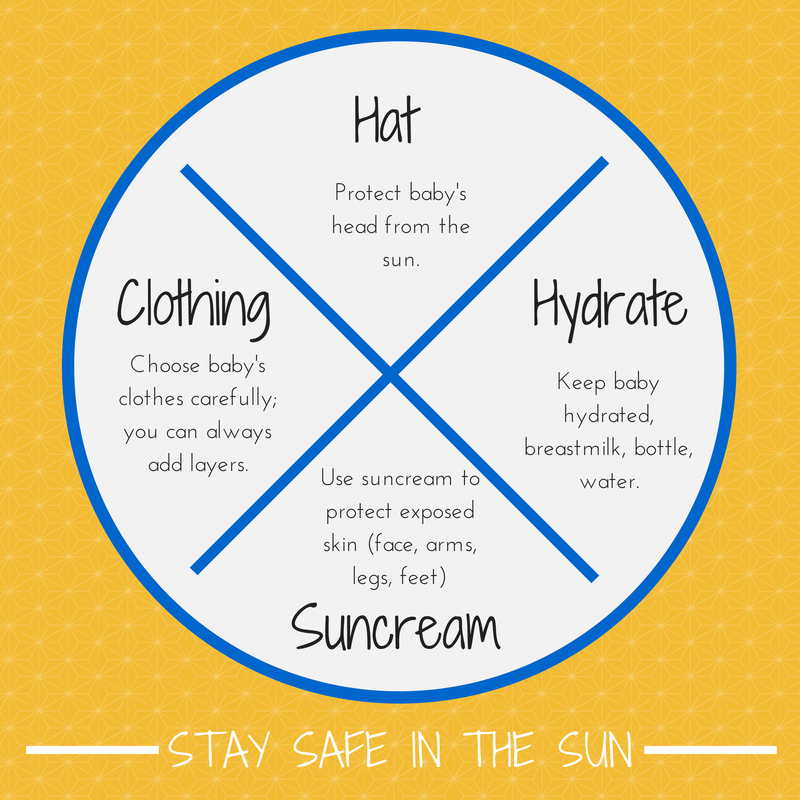 Protect your child from sunburn and windburn. Muslins can be draped over exposed legs or heads – but they are very thin and babies may still burn through them if not careful. UV protection blankets do exist but can be hard to source (also here). Hoods can be a mixed blessing in hot weather, as they can trap warm air when closed, thus increasing the temperature inside the carrier and reducing the flow of air around. A light, tie-on broad brimmed hat with neck coverage is often a better option. Clothing can help – lightweight long sleeves can add protection. Some slings provide mechanical protection from the sun, and some have UV protection features as well. Suncreams are an important part of caring for your child’s health (especially if they fall asleep and you are distracted.) Parasols can provide some shade. Cooling aids can be helpful. Some people will place a cool, damp muslin between their bare skin and baby’s, for coolness (others will use dry muslins to wick away sweat). Handheld fans can be very useful to blow cool air around. Sometimes people will use cool-packs to lay against skin every now and again, for brief periods. (I think this is safer than using freezer blocks in carrier pockets next to baby skin. Frozen peas against an ankle begin to hurt after a few moments, and babies may not be able to communicate the source of their discomfort well enough.) Splashing cool water can provide some relief… and regular breaks from the sling in the shade should be part and parcel of ensuring everyone is comfortable. Choose the time of day you use your carrier and consider other means of transport. It may be useful to just use your carrier in the cool of the morning or for evening strolls rather than in the midday sun. Parasols may offer some shade as you walk along. Some parents and children may dislike the sweatiness that comes from close contact in slings and may therefore feel cooler with in arms carrying, or in a pushchair. If you use a buggy do make sure that the seat itself isn’t hot from the sun and that you allow plenty of fresh air inside the chair as temperatures can rise very quickly indeed. The sun cover may indeed keep the sun off but can also trap heat and carbon dioxide due to the reduced air circulation, which can be dangerous for children. Such measures may go a long way to making you and your baby feel a lot happier in the sling that you have. Please note that each suggestion may not work for every situation. If you are unsure and would appreciate some more help, do get in touch with your local sling consultant/library for some support! The Sling Pages has a comprehensive list of such resources. When stretchy wraps are used with the classic pre-tied Pocket Wrap Cross Carry, it is best to have three layers across baby. This is because the elastic nature of the sling does not provide enough support with only one layer, and two cross layers can be easily divided by a baby pushing away or arching backwards. If you want to use your pre-tied stretchy in the PWCC or the Close Carrier with just two layers, ensure the cross passes are well distributed from knee pit to knee pit and up to the neck on both sides, be well aware of the risks and be vigilant of your baby’s movements, especially if you are likely to be distracted. You could try using a thin gauze scarf in place of the third layer of the Close Carrier. Front double hammock carries and hip carries (two-layers) are an option. They can be harder to master. Seated sideways carries may reduce the body surface contact. If you are using a Moby folded in half (six layers), try using it unfolded (three layers). Try single layer front carries to reduce the number of layers over baby, such as a Kangaroo carry which can have open sides. Try hip carries to reduce the amount of fabric around your body. Try high back carries (this may reduce surface area contact). These are often cool anyway.Try a seated sideways position to reduce the amount of surface contact. Try a back carry or a torso carry which may feel cooler. Fold the shoulder fabric that is cupping your shoulder over itself a little to reduce the coverage across your upper back. Flipped shoulders can also help with this. Try using your mei tai with the passes unspread across baby’s back (ensure the bunched up passes are not too tight and rubbing into his knee pits) to allow some airflow at the sides. Try a hip or back carry. Try a hip carry, if your carrier has this functionality. Try a back carry if your baby is able to sit unaided (enough upper body strength). Your local Sling Library may have a few options you can try out – it is always worth investigating to see what works for you and your baby comfort-wise. Sometimes hiring for a holiday may be cheaper than buying a new sling! Lightweight stretchy wraps include brands such as the Snugiwraps stretchy, the Hana Baby (due to its bamboo blend) and the Cot2Tot. The NCT Caboo may be a little cooler than the original Close Caboo as it is quite narrow with some mesh in the panel (the narrowness may make it less easy to use, however). Lightweight wraps (usually those with a lower density (the g/m2) are cooler and lighter than thicker and heavier ones) can be very useful. Gauze wraps like those from Wrapsody (the Bali Breeze) or Calin Bleu are thin and cool and good with smaller children. Thinner cotton wraps like EllaRoo are also an option – but may not be as sturdy for bigger children. 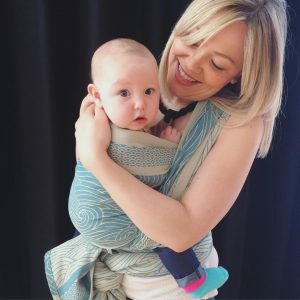 There are many supportive, lightweight , breathable cotton wraps around, like those from EasyCare, Didymos, thinner Girasols, the diamond weave Storchenwiege and Hoppediz light, for example. Oscha’s Ice Cotton range is very lightweight and strong. There are thick and thin versions of almost every combined blend of woven wrap available, so it is worth doing some research into the thickness and density. Traditionally, linen, hemp and silk are used to add strength and sturdiness to the softness of cotton, and can be lovely lightweight toddlerworthy wraps, but some blends can be thick and warm. 100% linens are often cool and supportive, and loose weaves can be airier than dense ones. Some people find merino blend wraps cool in warm weather, as the breathable wool wicks moisture to the surface to be carried away. Learning how to use a shorter wrap may be another way of reducing the amount of fabric wrapped around your body. There are a few mesh wraps around, such as the Fil’Up, which can be very cool to use. Ring slings are a great option in warmer weather, as they can be quick to take on and off and only cover half of your body. They are single layer slings, too. Again, like any woven wrap , the fabric involved can make a difference to its warmth. Lightweight muslin ring slings (such as those from Wrapamore), 100% linens (such as those from Oscha or Sakura Bloom) or thin but strong cotton/ blends are a good option here. Be cautious about buying thin ring slings from eBay or from non-recognised retailers. There are mesh water ring slings which can be useful in the water, but can also be a little sweaty in dry, hot conditions due to the fabric used. Simple pouches can be a good option as well, if used safely in an upright position, and there are several mesh carrying aids like the Suppori and the Tonga which can help take some of your child’s weight and remain cool. Sometimes these can feel warm, if there are multiple layers of fabric in the panel or if the fabric used is thick and dense. Sometimes lighter weight mei tais/half buckles can work well, tied in ways that allow airflow at the sides or with straps not spread across the whole of the parent’s back. Some examples are the Babyhawk, the thinner wrap conversion Chicago Hop-Tye, the Soul Tai (linen) the Bebe Sachi Mei Tai and the Storchenwiege Carrier. Some buckle carriers are designed for hot weather use, either in the lightness of the fabric they use, the lack of padding, or their design (mesh panels etc). Some people will find rucksack style carriers less warm than cross strap carriers, as there is less padding across the back (when used in front carries). Solarweave fabric (Integra and Connecta) is useful (it often also has UV resistant fabric), and the Beco Gemini/Toddler Cool have lightweight panels (also with UV resistant fabric). Many brands have mesh panels (e.g. the Ergobaby Cool range) or thin waterproof fabric (such as the Boba Air). Those with thick padded waists may feel just as hot to wear as their standard counterparts. In summary, yes you can carry your baby in hot weather, there are many things you can do to make it more enjoyable for both of you. Be mindful of your baby’s comfort and be careful of both your needs, and you won’t go far wrong!